On Wednesday evening, 2017 Indiana long jump state champion, Prommyse Hoosier announced her commitment to the University of Tennessee. Hoosier announced her commitment in between basketball games at her high school, Warren Central right here in Indianapolis, surround by her family and coaches. "I really love the coaches. A lot of my track friends are also coming into Tennessee. I love the campus and it's just really nice there...I'm really glad I chose Tennessee." Hoosier said of her reasoning behind picking Tennessee. 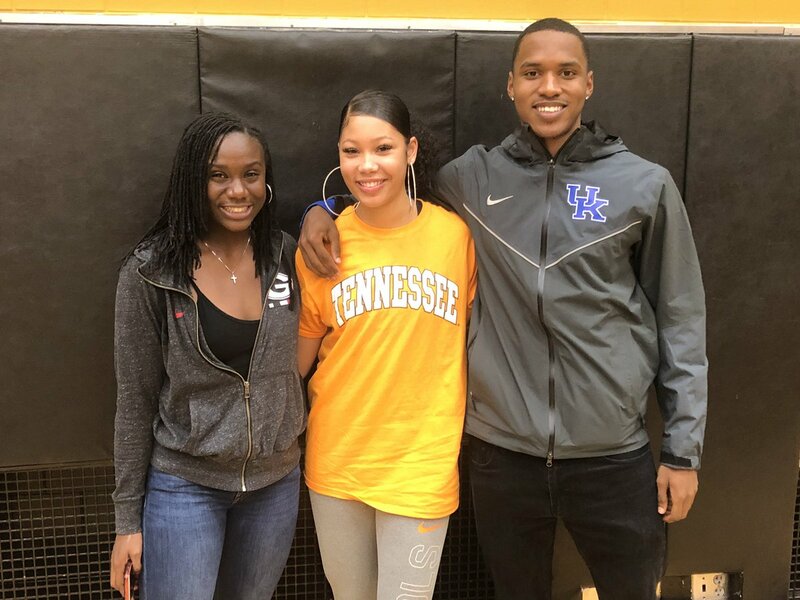 The Warren Central Senior had narrowed down her decision to just five schools a month ago, Auburn, Alabama, Tennessee, Louisiana State and Oregon. Louisiana State had been on of her dream schools since she was younger, but going into her junior year, she did not believe her marks would get her any attention from the university. Then she ended up tearing her ACL in the winter. She didn't start jumping again until mid-April, where she jumped a PR at the time of 18'4". It didn't take long for her to realize she had gotten better, despite her injury a few months before. She managed to break the sectional and regional record, with an 18' 8.75" and a 19' 11" respectively. Coming into the state meet, she held the highest seed by 8.5", so expectations were set high for her to walk away with her first individual state title. She more than went home with a first place medal around her neck, she went back to the eastside of Indianapolis with a new PR as well of 20' 1.25", topping 2nd place by over a foot. She even surprised herself with that performance. Jump forward just about 2 weeks later to the USA Junior Outdoor Championships, where she got to face her biggest competition yet. This didn't seem to scare her one bit though. It only motivated her to perform better than ever. And she did just that, setting a new PR for the 7th time that season with a massive jump of 20' 6.75", good enough for 3rd place and to become an alternate for Team USA at the U20 World Championships. Hoosier the #2 returning long jumper in the nation this year and has set some lofty goals for this upcoming season. She hopes to set a mark good enough to qualify her for the US Olympic Trials. To reach that goal she has to hit a mark of 21' 3", so she roughly has to clear another 8-9in. Based on the improvements she was able to make between the 2016 and 2017 seasons, it shouldn't be that difficult of an achievement to reach either. Hoosier had a couple of Indiana's best come out for her announcement. 12x champion and 2018 NCAA Champion in the 400m dash, Lynna Irby and 2017 NBN Indoor High Jump Champion Rahman Minor. All three of these athletes will be competing in the same conference again come next fall, in the SEC. All three competed in the MIC during high school.